The Foundation Program gives you the opportunity to engage in a structured study and meditation program on the essential teachings of the Buddhist spiritual path right here at Kadampa Meditation Center Madison. The secret of the Foundation Program’s success lies in the manageable commitment made by the student and in the clear structure of study. Students sign up to study a book or part of a book, agree to attend every class, learn the material, and to take a test at the conclusion of the study. Class meets once a week for two hours on Tuesday nights. There is also a commitment to participate in at least one chanted prayer session or General Program Class weekly. Currently on Monday nights Joyful Path of Good Fortune is studied, and on Wednesday nights How to Understand the Mind is studied. How to Understand the Mind – we gain the ability to transform our day-to-day living – including even the most difficult conditions – into opportunities for personal and spiritual development. 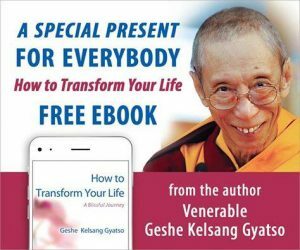 By pointing the way to an unchanging freedom and happiness, this immensely readable book challenges us to grow, and will have a remarkable impact on our life. If you have any questions about our Tuesday Evening Foundation Program, or would like more information, please contact us at info@meditationinmadison.org. Also, more info about Foundation Program Membership can be found within this site.